"Before he came down here, it never snowed. And afterwards, it did. I don't think it would be snowing now if he weren't still up there. Sometimes you can still catch me dancing in it." I can still vividly remember seeing Tim Burton's Edward Scissorhands for the first time. All of 13 years old, I sat and watched as a fantasy came to life on the large screen. And even though the film does not hold the same sense of amazement that was there 10 years ago; there is no denying that it is one of the most original films ever made. The film is a modern day fairy tale that tells the story of Edward, a young man created by a brilliant inventor, who died before finishing him and left Edward with scissors where he should have hands. One day when the local "Avon" representative (Wiest) calls at the historic mansion where Edward has been living alone, she takes him home to stay with her family. Although an oddity, he soon shows a talent for cutting both hair and hedges, and wins everybody's heart. Not everybody is in his court, as Edward's affection for Kim (Ryder)makes her boyfriend Jim (Hall) quite jealous. It isn't long until things go wrong and Edward's novelty begins to grow thin, and he is forced to try and fit in. Following up such previous Burton hits as Pee Wee's Big Adventure, Beetlejuice, and the wildly successful Batman. Upon its release in 1990, Edward Scissorhands drew flack for being too personal a film to Burton, too self-indulgent. I for one think that the film benefits from Burton's personal touches. There aren't many directors that would risk making a film this original after directing one of the biggest films of all time, but Burton carries it off with aplomb. As with most Burton films the pleasure is truly in the details. Small moments make this film, such as a scene (chapter 19) with Kim dancing amidst a flurry of snowflakes. Burton makes it work perfectly, and it still one of my favorite scenes ever put to film. And what Burton movie would be complete without a wonderful score by composer Danny Elfman? I think that Elfman hit a career high point with this film and the score is one of the few that I listen to on a regular basis. The cast, comprised of Burton regulars, is top notch. Depp plays Edward perfectly with the right amount of innocence, and, at one point in the film, anger. It is a performance that we have come to expect from Depp, but at this point in his career it was a breakthrough role. Ryder is very good as Kim, as are Wiest and Arkin as her parents. Anthony Michael hall plays Jim with all the subtlety of a chainsaw and Vincent Price closes off an amazing career with a small role as the inventor. 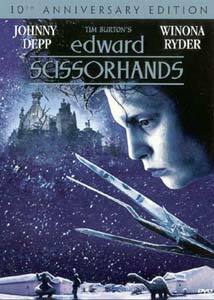 Is Edward Scissorhands Burton's best film? No, I still feel that last years Sleepy Hollow and 1995's Ed Wood still rank as his greatest, but I do have a soft place in my heart for Edward Scissorhands—his most creative and personal film. One would be hard pressed to find a fairy tale come to life that is better than this film. My previous video experience with Edward Scissorhands had been on VHS, so it was with great anticipation that I put this disc in my player. Simply put, this is the best I have ever seen this film look. Fox has chosen to present Edward Scissorhands in its original aspect ratio of 1.85:1 with the benefit of anamorphic enhancement. The colors presented on this disc are simply fantastic with no bleeding evident. From the bright hues of the suburban neighborhood to the dark almost black and white interiors of the inventors mansion there is not a single flaw evident. In fact, the only problem I had with the disc was a bit of print damage early in the film. Black levels and sharpness are fine and there is little to no visible grain. This is a top-notch transfer all the way. Audio Transfer Review: English Dolby Digital 4.0 and 2.0 tracks are offered and neither really tend to rattle the walls. The 4.0 track has good movement across the front three channels with a strong lack of surround activity. The front channels are near constantly in use, filled with either the score or ambient noise. The only time I noticed any sound from the rear speakers was when I switched to the Dolby 2.0 mix, which offers a bit fuller sounding mix. A French 2.0 surround mix is also offered. Overall a nice, but a rather disappointing effort. Extras Review: Touted as a 10th year anniversary edition of the film, the supplements offered range from inspired to somewhat basic. First, and most impressive, are two commentary tracks by two longtime collaborators, director Tim Burton and composer Danny Elfman. Burton's track is a bit slow moving with frequent gaps and at times I found myself wanting to skip through it. Although when the track gets going it is very interesting. He covers everything from casting to his upbringing and the effect it had on this film. Elfman's track is the real joy of the disc as he speaks at length about the score and seems to really enjoy talking about it. His commentary comes between gaps of music so the viewer is also treated to an unadvertised isolated score. Other extra features include two theatrical trailers presented in full frame 2.0 sound, as well as three TV spots; one American and two Spanish television spots. A brief promotional Featurette is included, as is a feature called Soundbites that is essentially an electronic press kit with pre-recorded clips of the stars talking about the movie. Selections of concept art, as well as a very nice set of animated menus, round out the set. Edward Scissorhands is a wonderful movie that everyone should own. The fact that the film is finally available on DVD should be enough for any Tim Burton fan. If that is not enough to get you to buy the disc, buy it for the amazing transfer and extras. This is the last of Burton's films, other than Ed Wood, to arrive on disc and it is a welcome addition to my collection. Highly Recommended!